Want to set a custom song as ringtone? 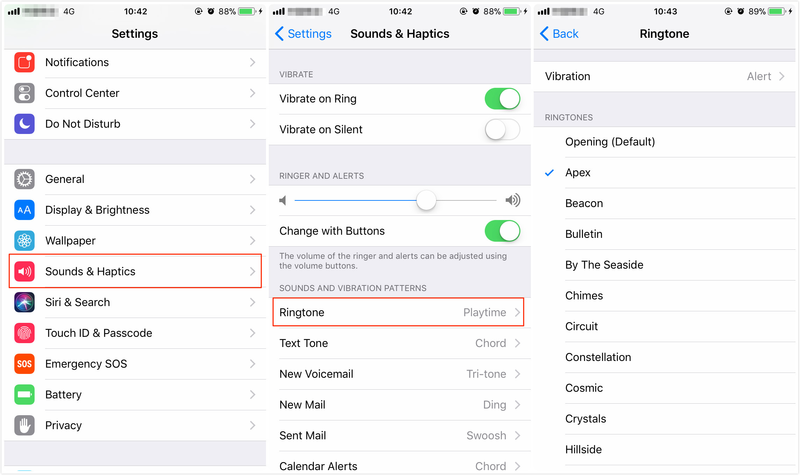 Read this guide and you will get a quick way to change your default ringtone on your iPhone 6/7/8/X running iOS 10/11. Download AnyTrans on your computer so that you can manage ringtones, music and more on your iPhone 6/7/8/X in iOS 10/11. Now read this guide on How to Change and Set Custom Ringtones on iOS 10/11. iPhone 7 and iPhone 7 Plus showed up with iOS 10 last year. Amazed by its great features, many people have already bought the iPhone 7. Recently, a lot of people have emailed us asking how to change the default ringtone on iPhone 7 in iOS 10. Thus, in this post, we will show you a simple method to change and set your favorite ringtone on iPhone 7 in iOS 10. If you have upgraded to iOS 11 or gotten a brand new iPhone 8 (Plus)/X, don't dishearten, these methods also works to change and set ringtones on iPhone 8 (Plus)/X and iOS 11. Most of you may don't have custom ringtones on your iPhone and the latest iTunes does no longer supporting make ringtones, that's why we are here introducing you this amazing tool - AnyTrans. 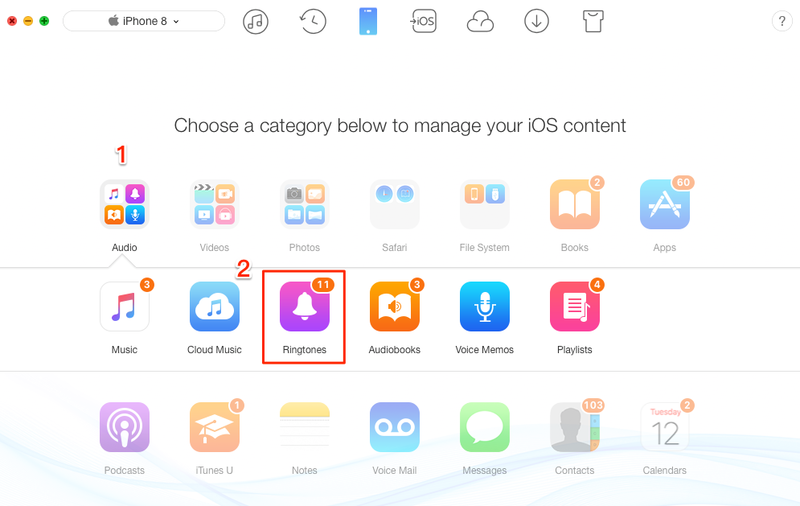 Developed by iMobie team, AnyTrans is a full-way iOS file manager for all iOS devices running iOS 9/10 and even the latest iOS 11. It can also work as an easy-to-use iPhone ringtone maker for it allows you to transfer songs from computer to iPhone as ringtones. Here are reasons why you will like AnyTrans. 1. You can custom ringtones out of any songs with AnyTrans, no matter purchased songs or non-purchased songs. 2. You can save a lot of time using AnyTrans to custom ringtones. Within just a few minutes, it can transfer a few hundred songs to iPhone as ringtones. 3. Your data is always safe with AnyTrans. You know, syncing ringtones with iTunes will erase existing data on iDevice. This is no longer the case if you use AnyTrans. 4. AnyTrans saves you from a lot of complicated editing process. 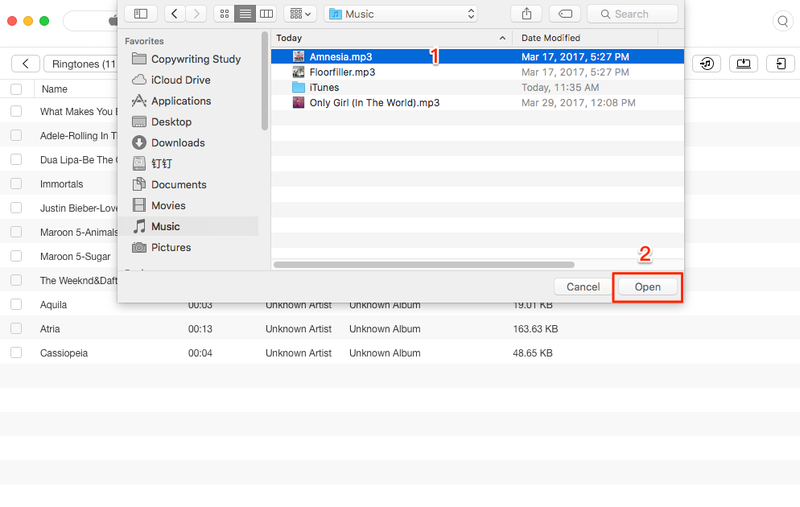 In 12.7 easier version of iTunes, you need to set the start time and do format convert first, then add them to iTunes library, sync. With AnyTrans, This can be replaced by a few clicks in AnyTrans. Next, let's see how to use AnyTrans to change and set custom ringtones on iOS 10/11. AnyTrans is developed by Apple certificated developer and it is also Norton and McAfee secured. You have our guarantee that AnyTrans does no harm to your devices and situations like information leakage and data loss would never occur. Please be free to use AnyTrans. Step 1. Download AnyTrans on PC or Mac. Launch it and connect with your device. Any iPhone like iPhone 6/6s/7/8/X or iPad running iOS 10/11 will do. Step 2. Go to the main page of AnyTrans and click on Device tab > Click the button as the screenshot shows to you. Step 3. Click on Audio and choose Ringtones. Step 4. Click the Settings tab to set the start time and ringtones length > Click “+” button > Browse and choose a song or ringtone on your computer > Click Open to start transferring. AnyTrans will automatically convert the song to iPhone compatible ringtone. Note: After converting the song to ringtone on your iPhone with AnyTrans, you can now set a custom ringtone on your device: Go to Settings > Sounds & Haptics > Ringtone > Choose the song you added.